Herbert A. Simon (Nobel Prize – 1976) was interested in the role of knowledge in expertise. He was the first to say that becoming an expert required about 10 years of experience. He and his colleagues estimated that expertise was the result of learning roughly 50,000 chunks of information. Malcolm Gladwell highlighted this rule in his book, Outliers: The Story of Success. He states that men and women who have spent more than 10,000 hours to learn something end up being out of the ordinary in this area. In the same vein, regarding software development, Scott Hanselman recommend to ‘’read lots of code and lots of books, pick a language that fits your brain and helps you learn how to think, and when you do think, think about abstractions. How do you become an expert in architecting mobile applications? Understanding of UX interaction patterns is a key learning for sure. You could read books (and you should) but do not underestimate first hand experiences with real devices. I firmly believe that, of the 50,000 chunks of information to acquire, the most important are the actual experiences with mobile OS. Every year you should experiment with a new mobile OS. I used to change phones every 6 months. From the initial launch of the iPhone in 2007, I moved to IOS and I have been an enthusiastic user for many years. In 2013, having learned everything I needed to know about IOS and in a need for a phablet, I moved to Android. Last year, I wrote about my experience with a 7-inch tablet Android as a phone. 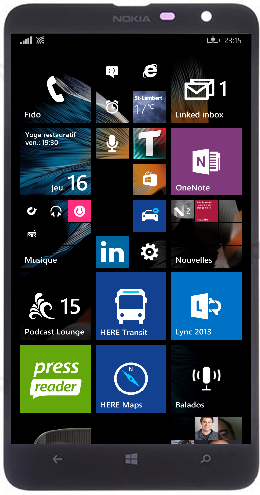 Nine months ago, at the beginning of 2014, I have migrated to Windows Phone. My current phone is a Nokia Lumia 1320. I am extremely pleased with this 6 inches device and I love the Windows operating system. I agree with Scott Hanselman Windows Phone 8.1 is now definitely as good as Android or IOS. I would have kept this phone for a while longer, but, unfortunately, I will changed for an iPhone 5 in the coming weeks. For the upcoming months, I will thoroughly test the Personal Task Manager that we develop with IOS8. Since we expect that the vast majority of our customers will use IOS8, I want to ensure that the user experience will be perfect. In addition, this will allow me to experiment and update myself with the latest functionalities of IOS8. So do not be surprised if you see me these days with an old iPhone 5. One day, I will be back with a Windows Phone. In the meantime, my focus is the good of my product. Categories: Architecture, Lifestyle | Permalink.